Huldah: a prophetess in Jerusalem who was consulted when the Book of Law was discovered. (2 Kings 22:14-20; 2 Chronicles 34:22-28). Their names are rarely mentioned in Sunday’s Scripture readings. Nor are they part of the homily. Shiprah and Puah. Lois and Eunice. Joanna and Susanna. To many Roman Catholics, it’s as if these women in the Bible never existed at all. The Spokane Valley event will be among hundreds of gatherings worldwide to observe the Feast Day of St. Mary of Magdala, one of the women in the Bible whose story has been minimized, excised or mischaracterized for centuries, organizers say. Depicted as a prostitute and redeemed sinner, Mary of Magdala was actually a devoted disciple of Jesus and the first person to witness him after the resurrection, according to Biblical scholars. She also was a leader in the early church and played a significant role in Jesus’ ministry, emphasized Albo, a chaplain for Hospice of Spokane. Albo was so inspired by Mary Magdalene’s courage and generosity that three years ago she spearheaded efforts to bury the cremated remains of 197 people who were never claimed at the Spokane County medical examiner’s office. Her example was included in a December 2005 Newsweek article about Mary Magdalene and the significance of women in the Scripture. The Spokane Valley resident not only has spearheaded local efforts to celebrate the Feast of St. Mary of Magdala; she also wrote the prayer service that will be used at many of the gatherings worldwide. 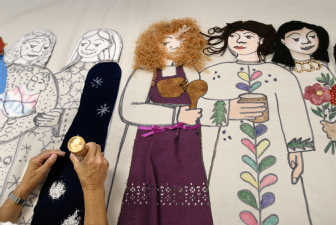 Earlier this week, Albo and about a dozen women gathered at St. Mary’s to finish the elaborate banners, embellishing them with silk, brocade, beads, yarn, African prints, batik and other rich, colorful materials. As they sewed, ironed, stitched and decorated the female figures, the women from St. Aloysius, Sacred Heart, St. Ann, St. Thomas More and other parishes in the diocese talked about their children and grandchildren, their jobs and other aspects of their day-to-day lives. “These women give me strength,” said Diana Sanderson of St. Mary’s, referring to both the women on the banner and those who worked alongside her. Members of the chorus will then call these women by name and share their stories – Miriam, who saved her brother, Moses; Mary of Bethany, who invited Jesus to dinner and anointed his feet with perfume; Lois and Eunice, mother and grandmother to the church leader, Timothy. As part of the worldwide event, organizers in Spokane will ask people to consider sending postcards to the U.S. Conference of Catholic Bishops, urging them to “put women back in the biblical picture.” Pope Benedict XVI recently announced that the theme of the October 2008 World Synod of Bishops will be “The Word of God in the Life and Mission of the Church. To include women’s perspectives at the synod, FutureChurch – a national coalition of Catholics who seek a greater role for laity – launched a postcard campaign asking Catholic leaders to invite female biblical scholars to serve as consultants to the synod, expand opportunities for women preachers, restore biblical women leaders to lectionary readings and devote more pastoral attention to the way and Jesus and St. Paul included women leaders. Reach reporter Virginia de Leon at (509) 459-5312 or virginiad@spokesman.com.